Spring might be Canberra's showiest season, but autumn is when Canberra's famous street trees really come into their own. In October 2013 we brought you two brochures that promoted Canberra’s "riot of spring colour." Today we are highlighting their autumn companions. 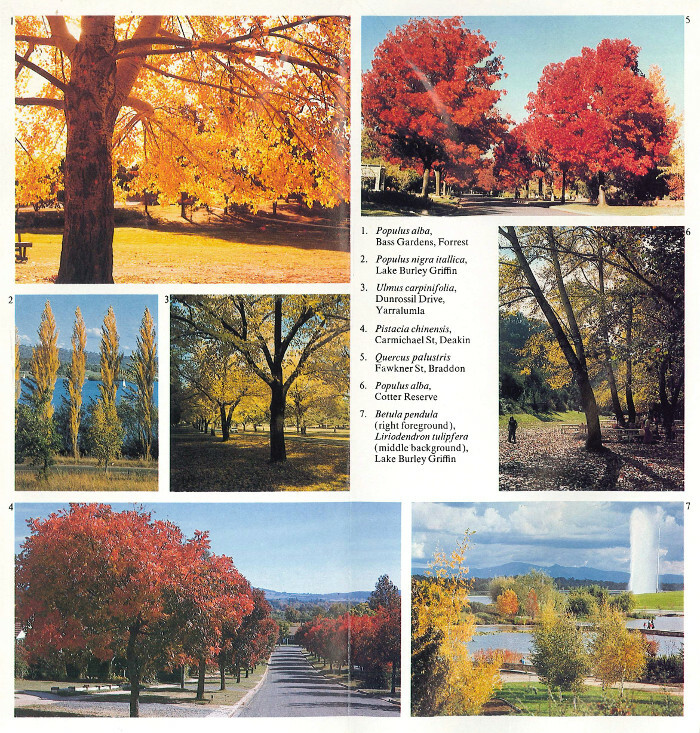 These brochures encourage visitors to come to Canberra to admire the changing colours of the many deciduous trees planted around the Capital and provide this month’s ArchivesACT Find of the Month. 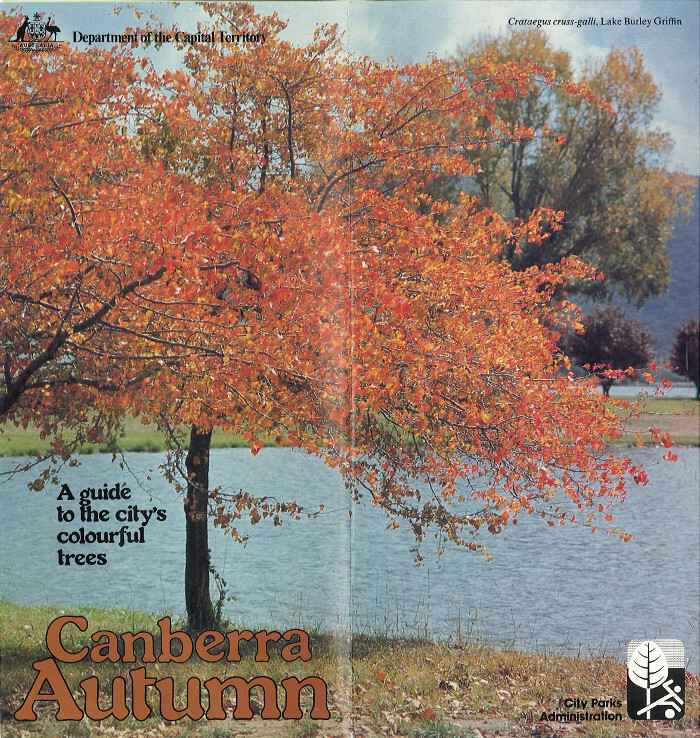 The first of these brochures is 'Canberra Autumn: A Guide to the City’s Colourful Trees' published in 1980. This guide identifies many exotic tree species that change colour each autumn and describes their "dramatic contrast to the greys and greens of the native eucalyptus and coniferous species." This guide estimates "that there are some twenty-seven genera of exotic deciduous trees" that "colour with remarkable regularity each year." This makes it possible to plan visits to Canberra to "view the landscape at its peak of colour before the colder months." The guide provides an extensive listing of the trees you can find in Canberra, detailing the plant species, their common names, and countries of origin. There is also and a map showing where "areas of particular scenic attraction" can be found. 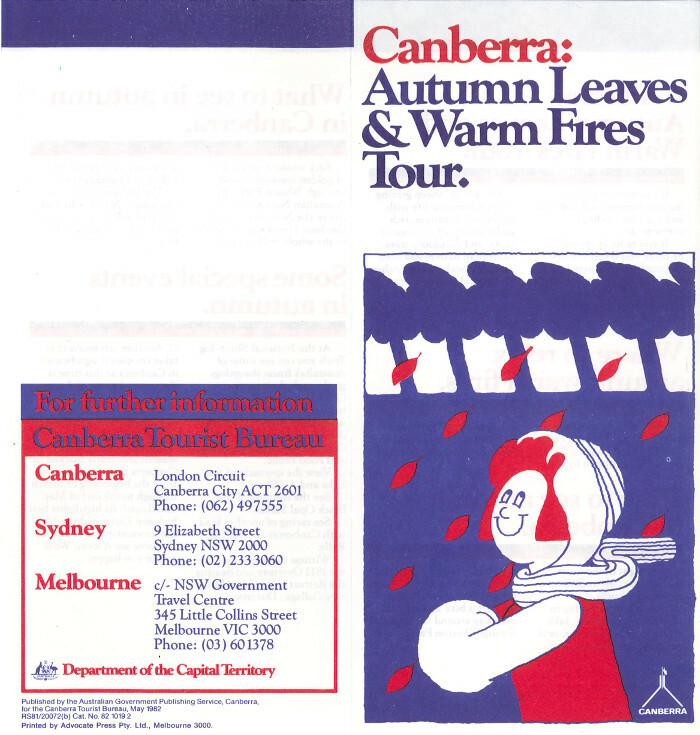 The second brochure 'Canberra: Autumn Leaves and Warm Fires Tour' proclaims that "If you’re lucky enough to be there you’ll feel the first bracing hint of winter." Not wishing to scare visitors away, the brochure goes on to provide a list of places where you can relax in front of an open fire. Many of these are still operating today, although some, like the Boot and Flogger, are sadly departed. Much like the spring version, this autumn brochure lists a number of events visitors can catch during the season. 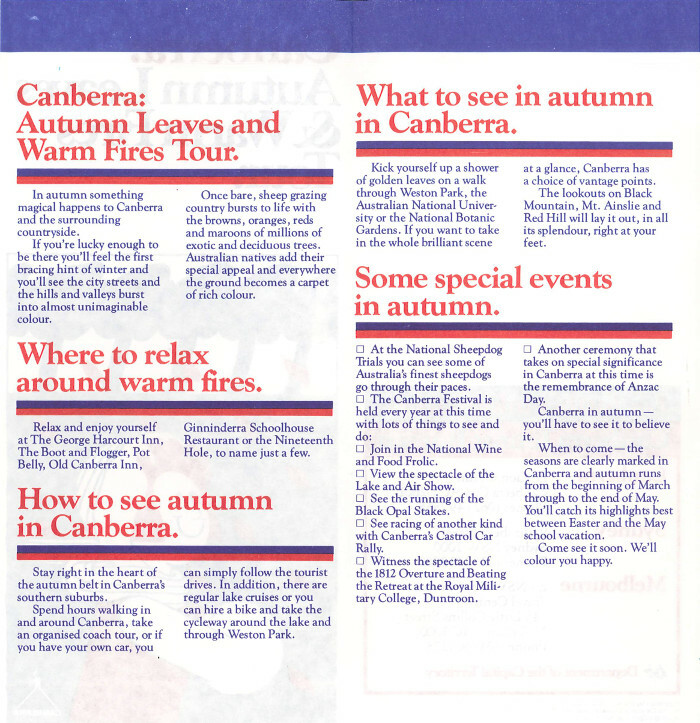 Unlike the spring events, not all of Canberra’s autumn attractions of the 1980s survive today. Who remembers the National Wine and Food Frolic or the Lake and Air Show? You can however, always experience the sheer joy when you "Kick yourself up a shower of golden leaves on a walk through Weston Park." It is true that "In autumn something magical happens to Canberra." The majority of the trees that provide Canberra's autumn colours were raised at Yarralumla Nursery which is celebrating its 100th Birthday on April 6. Canberrans have the opportunity to celebrate with the Nursery at a special community event from 10 am to 3 pm on Sunday 6 April 2014. The event will be held at Weston Park, Yarralumla, off Banks Street.